Hi! 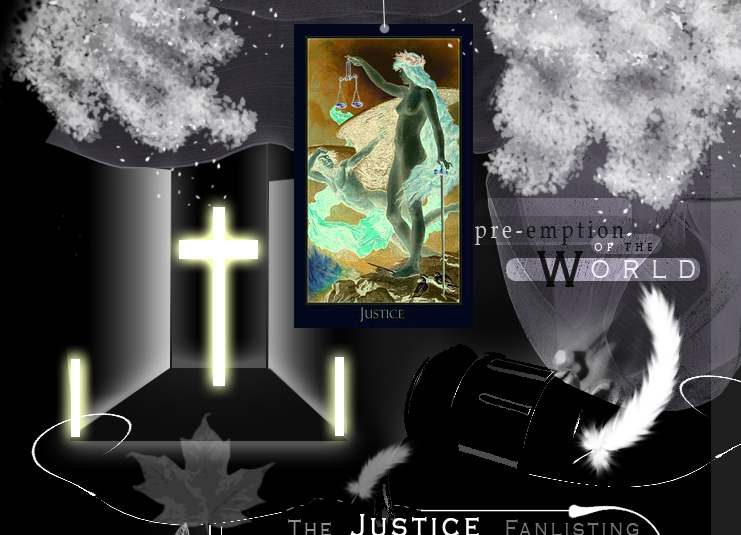 Welcome to "pre-emption of the World", the TFL approved fanlisting for Justice , the conception that in my personal opinion rules the world! Doubtless, Justice isn't something explainable with words, because everyone feels this conception in different modes. Elements that decreee our idea of Justice are all of the parts of our life that becoming part of us: parents, friends, enemies, funny moments, sad moments, desperation. Emotions and feelings are part of us, and as them, Justice is our conception of the right things in the world. I strongly believe in Justice, because it isn't just a human form of explaination of the fate, but the exence of the soul, because in all of us there's a light that won't lose its shining, the one that we need to follow to be in peace with the world. Please, choose a link from the left to fully access the site, and if you're a fan of Justice, feel free to join its fandom! Used images from	Photobucket. Do not reproduce.